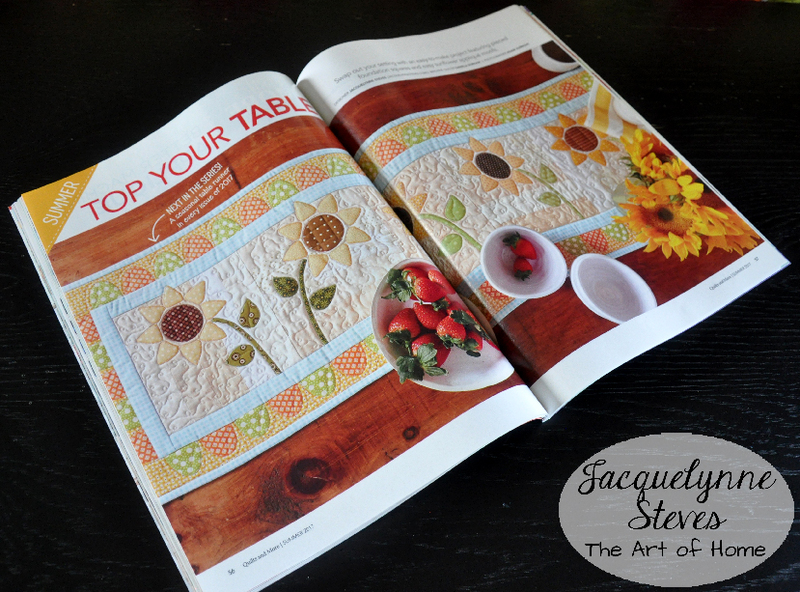 My Summer Table Runner in Quilts & More Magazine! It’s been so exciting to have my table runner series featured in Quilts & More magazine during the year of 2017! TODAY the summer issue will be released- so check your newsstands or local quilt shop, or if you have a subscription run right out to the mailbox to see if it’s arrived! You can also get a digital copy here. Do you like sunflowers? Yes? Then I think you will like this table runner! I’ve done a pieced “split rail” block for the background, and I like how the applique extends onto the blue border. It was really fun going through my scraps to find different yellows and greens for the applique. My quilter, Danny, once again did a beautiful job. She did a free motion loop pattern in the background, a simple cross hatch in the flower centers, added a vein to the leaves, and an echo and “V” pattern in the border scallops. Don’t forget to get your copy before they sell out! Want to see the first runner in the series? Click here. This article was posted in Art-Design-Business, Books & Publications, Featured, Sewing & Quilting, Summer. Bookmark the permalink. Follow comments with the RSS feed for this post.Post a Comment or leave a trackback: Trackback URL. I love the tablerunner! Quilts and More is not yet available in my area stores as of today,any day now,it was released yesterday.I never miss an issue. What fabric is that made from? It would look perfect in my home! 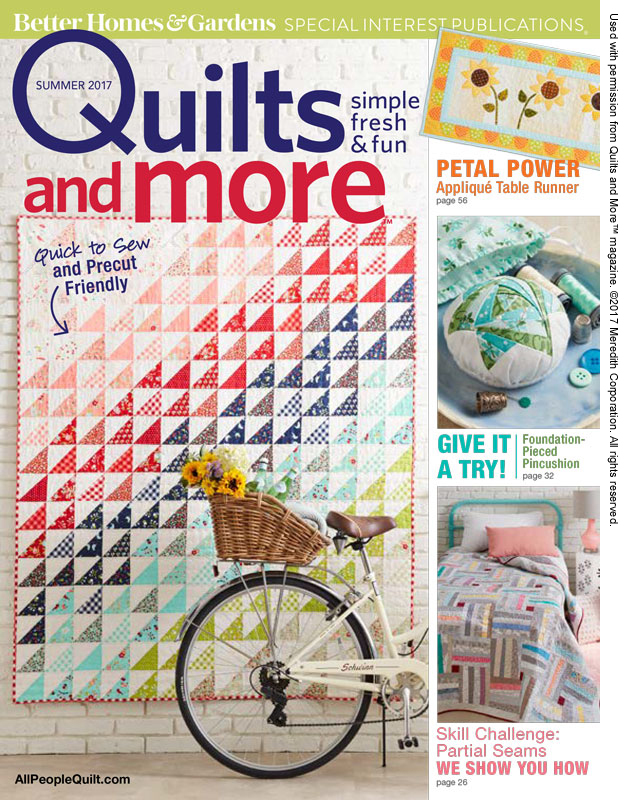 FYI,Quilts and More is a news stand issue only,no subscriptions! Only digital issues availabe.I have begged many times for subscriptions. I guess it is aimed at quilt shops to draw traffic. Thrilled to see your work in there!I would love to see more from you. Yes it’s too bad they don’t offer subscriptions! The fabrics in this were from my scraps and stash. I understand completely how you feel….I’ve been trying to put it into words but you articulated it so well. “Slow down”….is what I’m telling myself. I’m so glad I get your newsletter….I’ve been so busy lately I’ve not kept up with my favorite blogs and newsletters and I’m afraid I’ve been one of those people who lets her box overflow and then just deletes randomly. I’ll be more careful in the future….I really do love your work…your designs…and your generosity. Thank you so much. I love the new table runner. The colors go so well with my apple green and yellow kitchen. I also really like sunflowers and plant them in my garden almost every year. The seeds make great that’s for the birds. Thank you so. I have for all the time you spend designing and sharing pretty things for us to make. Jacquelynne, do take the time to just enjoy life. I work from home and take my lunch time to wander to my studio and sew for thirty minutes or take Shilo, my 100+ pound baby for a walk (weather permitting). I try to work on applique prep or finishing quilts during conference calls. Love all your table runner patterns and especially your embroidery patterns. How gorgeous! I love sunflowers. Thanks for sharing. 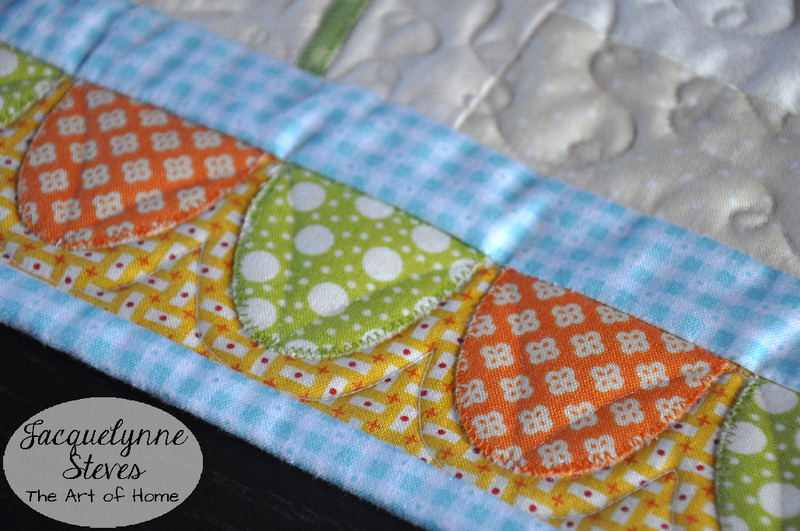 Can’t wait to pick my copy of Quilts and More to get your second pattern. I love it. 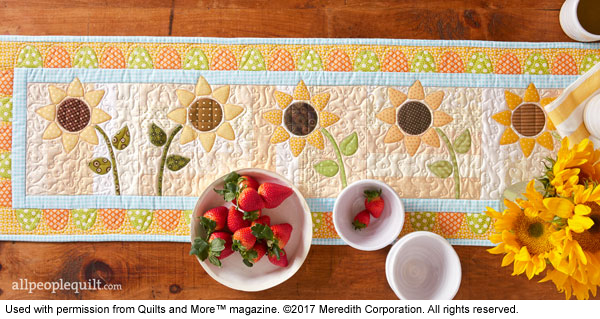 Your sunflower table runner is right on time. Making a table runner for each season for my daughter’s birthday. Sunflowers are her favorite! Thank you so much for this design. Take a breath and take a few minutes each day for yourself. Don’t burn yourself out. We, as your subscribers, will look forward to your posts and emails whenever you get them done. Love the sunflower table runner. 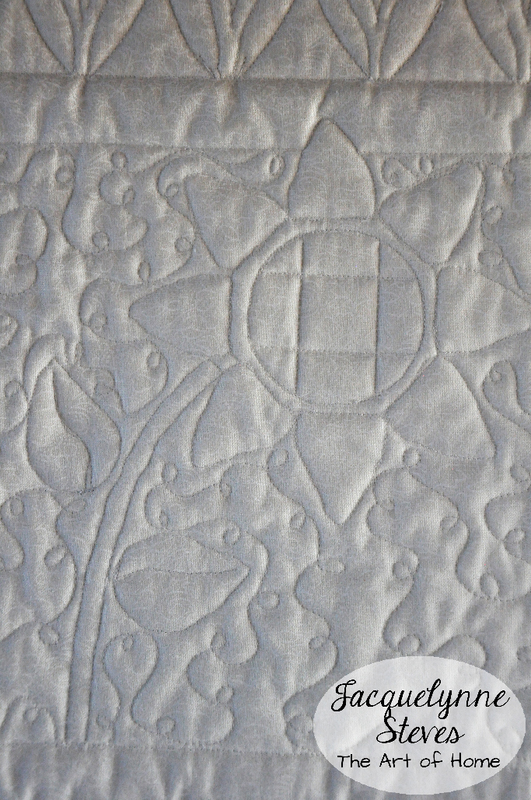 I’m learning to quilt teaching myself, and love table runners, mug rugs and wall hangings. Relax and take time for yourself and family. Beautiful runner , I love sunflowers ! I love Quilts and More Magazine – and especially loved your table runner – went right over and subscribed and downloaded / printed the pattern out!!! Will be a wonderful runner on our kitchen table! Thank you! In the hope that this reaches you, I want to tell you how much I enjoy receiving your emails. Your posts are always upbeat, joyful, and full of humor. Best of all, you’re a “regular” person, someone I can relate to and who I truly appreciate. Like you, I find that life sometimes gets away from me with all the busy-ness that occurs. But you’re right, in the long run it’s how you manage that busy-ness and what choices you make about how you’re going to live your life. I applaud your choices, and if you ever needed to take a break from all of us, I guarantee that not only I, but so many of your readers would be right there waiting for you when you got back! In the meantime, I look forward to your next post. PS: I love this table runner. After all the rain we’ve had lately, I can just imagine how it would bring in the sunshine! 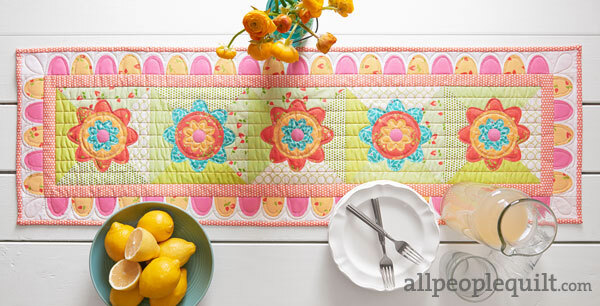 Bright and cheerful table runner. So pretty. Love the table runner! I guess I need to go out to purchase before they are gone. Just got this issue today…love your pattern! 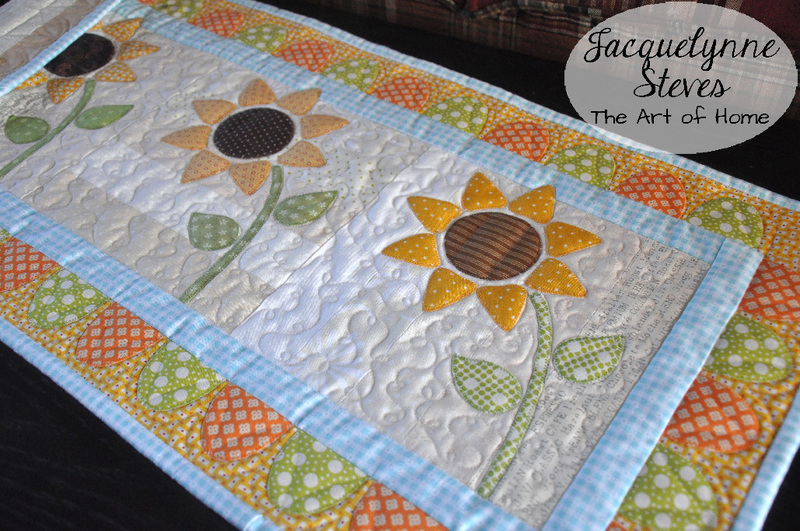 Your sunflower tablerunner is beautiful!! I hope this is not number three post. If yes sorry everyone. I will look for magazine when I go shopping. I still haven’t finished looking at the last QnM magazine. Bad me. Lol. Love your table runner. I love the table runner! I’m going to look for it while I’m out and about tomorrow. I know you are so busy with everything you have going on but you really need to take time for yourself. You may have to say no every now and then so you can enjoy doing the things you love. 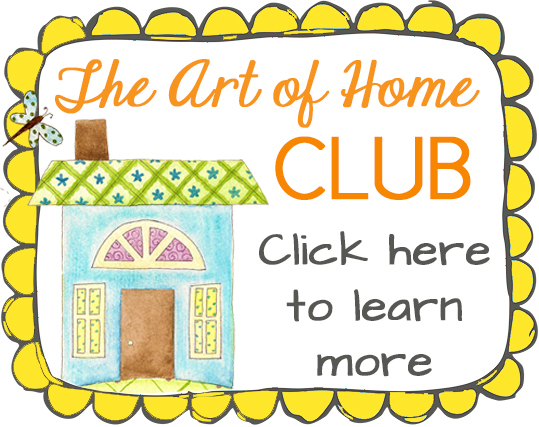 I enjoy your newsletters and being a member of The Art of Home club. I really appreciate all the freebies you send our way, too. Hi Kaye! 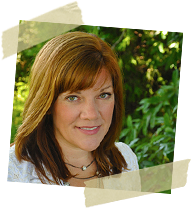 Thanks so much for your very much for your kind comment- I’m so glad that you are enjoying the Club and my newsletters! I love the table runner, don’t get the magazine as I already get a couple of Australian ones here. I love your site, the Art of Home Club and everything else. I am also having a really bad case of not taking time out. I just don’t have time, I am not even nearly keeping up with Art of Home etc. Selling my home, packing up and rebuilding is becoming a nightmare. Keep telling myself to calm down until settled and able to get back to the sewing room. I have all your newsletter saved, ready to go. Love and good wishes. Beautiful!!! I love sunflowers. I agree, we have to enjoy the small things in life. Wishing you a wonderful day. 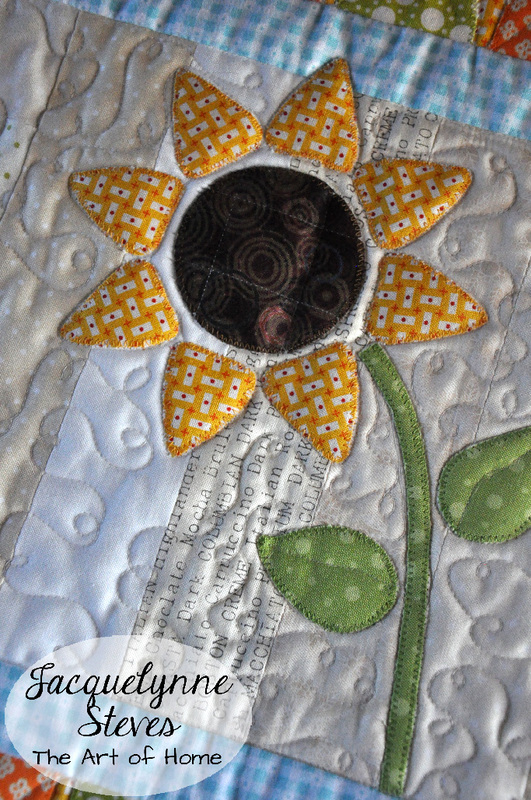 I love the Sunflowers table runner – I want to make it right now! Congrats! Your table topper is so sweet! Love the table runner! Will definitely get the issue! Thoroughly enjoy your newsletter as well as the Club! Thank you for sharing your creativity, your lovely patterns and your time. I love sun flowers, and this makes me want to make some!